A family of Amsterdam distinguished for the number of its members that filled rabbinic offices. 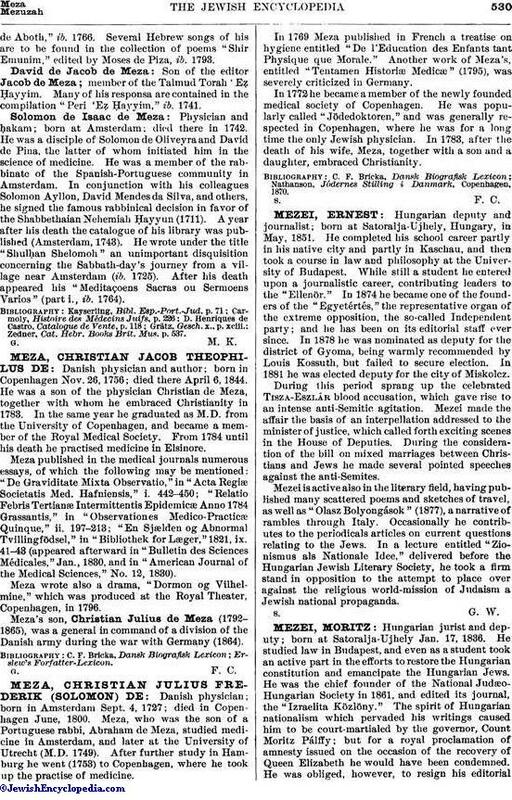 Member of the Talmud Torah 'Eẓ Ḥayyim in Amsterdam, and author of a sermon, delivered in Portuguese on the day of solemn devotion, "Sermão Moral . . . na Occasião de Hum Dia Solemne de Oração . . . em 4 Nisan 5507 = 15 Março 1747," Amsterdam, 1747. Son of Abraham de Meza; died in Amsterdam after 1793. He published: "Sermão da Liberdade, Pregado na K. K. de Talmud Torah em 28. Yjar 5527," Amsterdam, 1767; "Sermão Moral, Preg. . . . em S. Emor, 13 Yjar 5532," ib. 1767; "Sermão Moral Sobre o Pezo do Peccado, Preg. em S. Qui Tetsè 9 Elul 5546," ib. 1786. He prepared also a new edition of "Paraphrasis Caldayca en los Cantares de Selomoh como Tambien los Apophthegmasde Aboth," ib. 1766. Several Hebrew songs of his are to be found in the collection of poems "Shir Emunim," edited by Moses de Piza, ib. 1793. 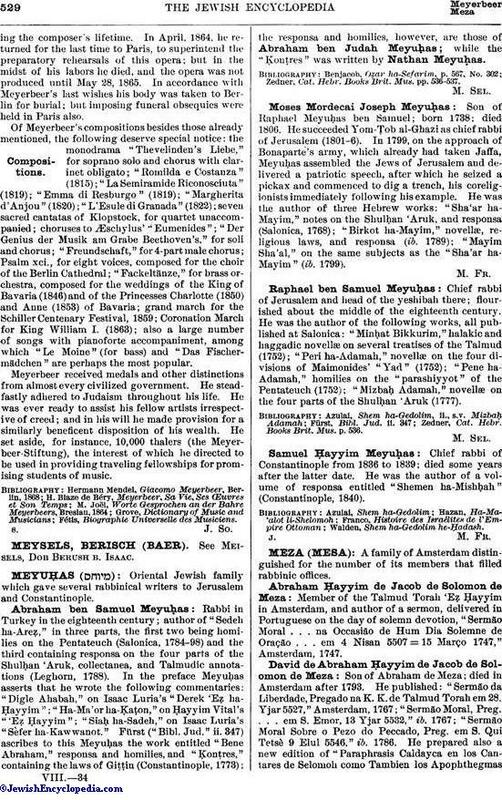 Son of the editor Jacob de Meza; member of the Talmud Torah 'Eẓ Ḥayyim. Many of his responsa are contained in the compilation "Peri 'Eẓ Ḥayyim," ib. 1741. Physician and ḥakam; born at Amsterdam; died there in 1742. He was a disciple of Solomon de Oliveyra and David de Pina, the latter of whom initiated him in the science of medicine. He was a member of the rabbinate of the Spanish-Portuguese community in Amsterdam. In conjunction with his colleagues Solomon Ayllon, David Mendes da Silva, and others, he signed the famous rabbinical decision in favor of the Shabbethaian Nehemiah Ḥayyun (1711). A year after his death the catalogue of his library was published (Amsterdam, 1743). He wrote under the title "Shulḥan Shelomoh" an unimportant disquisition concerning the Sabbath-day's journey from a village near Amsterdam (ib. 1725). After his death appeared his "Meditaçoens Sacras ou Sermoens Varios" (part i, ib. 1764). Zedner, Cat. Hebr. Books Brit. Mus. p. 537.